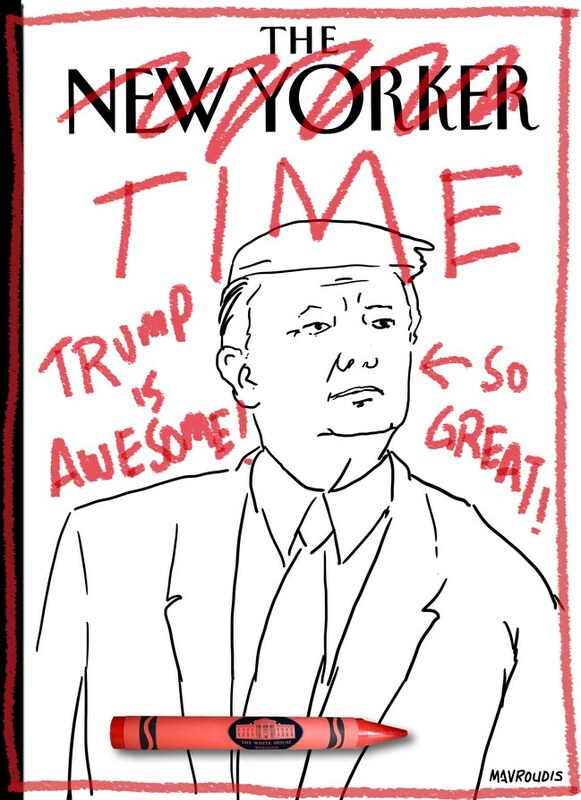 A sharp New Yorker cartoon by John Mavroudis lampoons President Donald Trump for the fake Time magazine covers recently found to be hanging in some of his hotels. The New Yorker joked in the description of the cartoon that it was "one of President Trump's prized possessions." 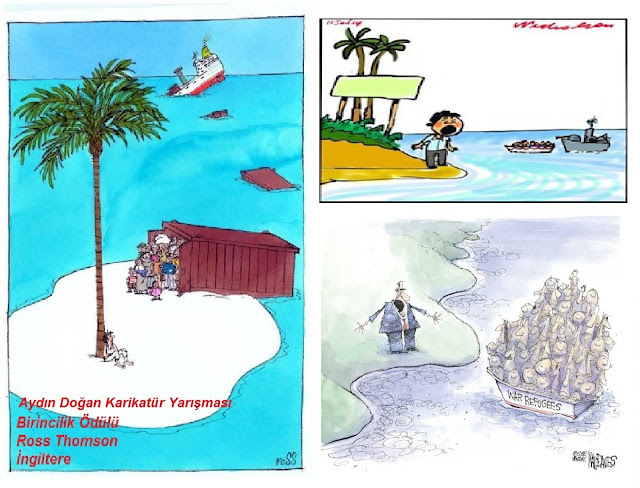 Cartoons by Ross Thompson, unknown and Matt Davies. The Karikatür Haber website has drawn attention to disturbing similarities between some cartoons that were rewarded at the 34th edition of the Aydın Doğan International Cartoon Competition and works which have won prizes in the past. 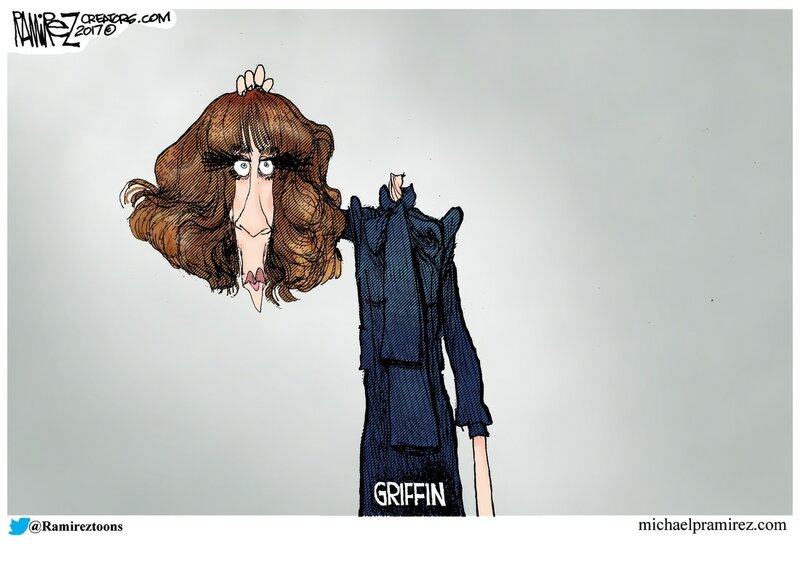 Some likeness are quite blatant whereas others should be given the benefit of the doubt. R.O. Blechman’s Ink Tank archive will have a home within the D.B. Dowd Modern Graphic History Library at Washington University. The Ink Tank archive includes the production materials for more than 350 commercials as well as the films Simple Gifts and The Soldier’s Tale, based on the Stravinsky composition, plus short animations for NBC, CBS and other clients. There is an unfinished film version of Candide. 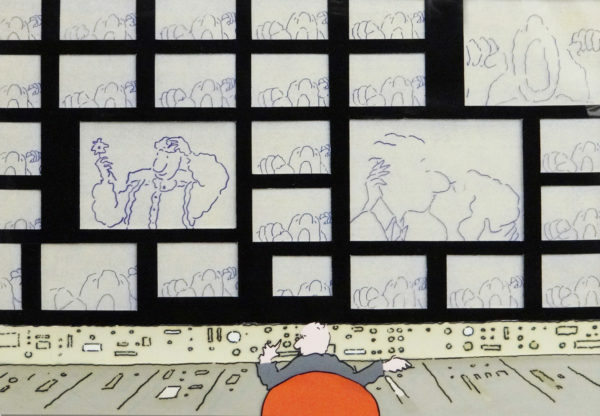 But beyond the films and media, there are many, many drawings, animation cels, background paintings, storyboards and other production materials, as well as business materials and documents. Susan Ferrier Mackay in The Globe and Mail. Editorial cartoonist Merle (Ting) Tingley’s most famous creation was a whimsical worm named Luke. In 1948, the jaunty, pipe-smoking invertebrate wriggled off the tip of Mr. Tingley’s bored pen and into the middle of a highly technical drawing. 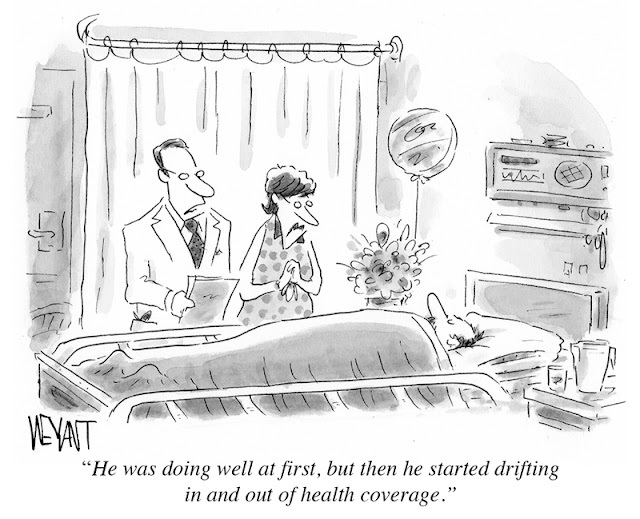 Long-time political cartoonist Chuck Asay has announced his retirement. Again. 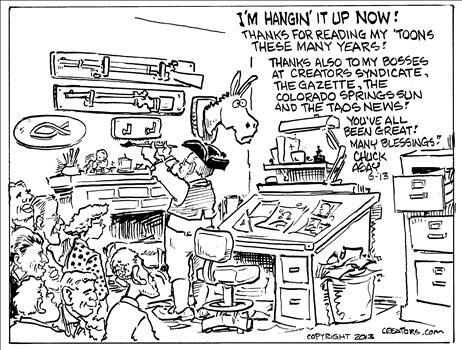 Asay stepped down from his post at the Colorado Springs Gazette in 2007, but continued to draw for Creators Syndicate until 2013. 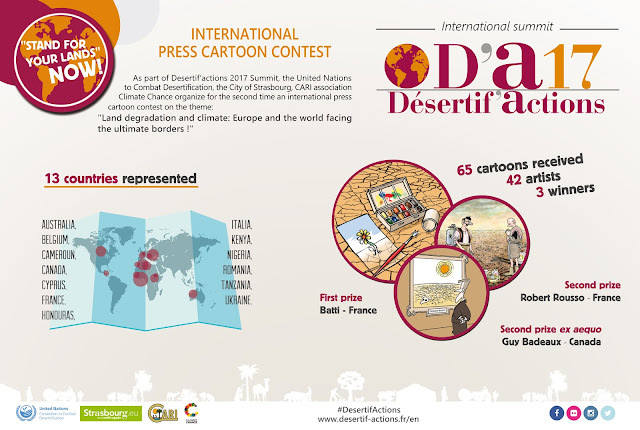 The jury of the International Editorial Cartoon Competition, under the theme "Land Degradation and Climate: Europe and the World Facing the Ultimate Borders", selected 33 drawings to be exhibited at the Strasbourg City Hall from June 26 to 30 as part of the Desertification Summit 2017. 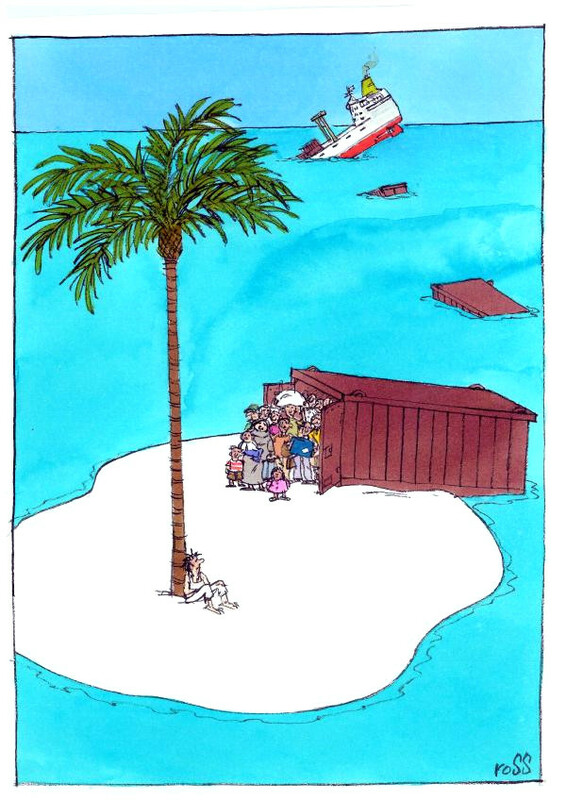 Rob Tornoe in Editor & Publisher. After an era marked by downsizing and low morale, many newspapers are experiencing a rebirth of their journalistic vigor thanks to the campaign and subsequent election of Donald Trump as president. 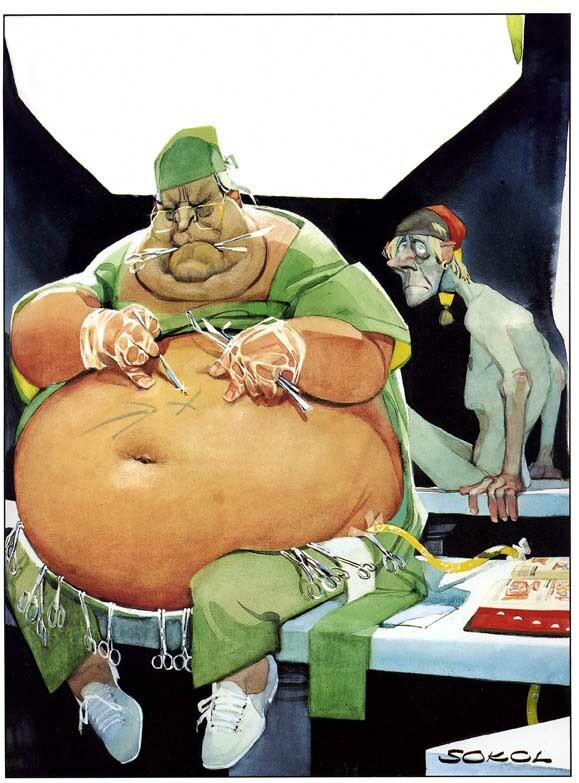 Today, after a remarkable 50 years, we say goodbye to Gerald Scarfe. 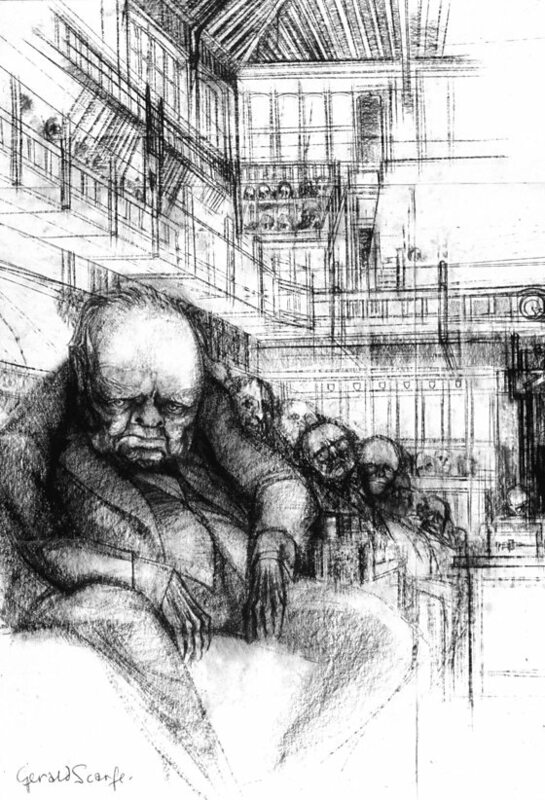 For half a century his superb weekly Sunday Times cartoons have lacerated generations of British political leaders from Harold Wilson to Theresa May. There are strong rumours that Justin Trudeau will NOT allow the former U.S. Embassy across from Parliament Hill to be used for the creation of a long-recommended National Portrait Gallery of Canada but will use it instead for political purposes. PLEASE show your support for creating such a gallery NOW before it is too late! A studious Helmut Kohl by the great Austrian cartoonist Erich Sokol. 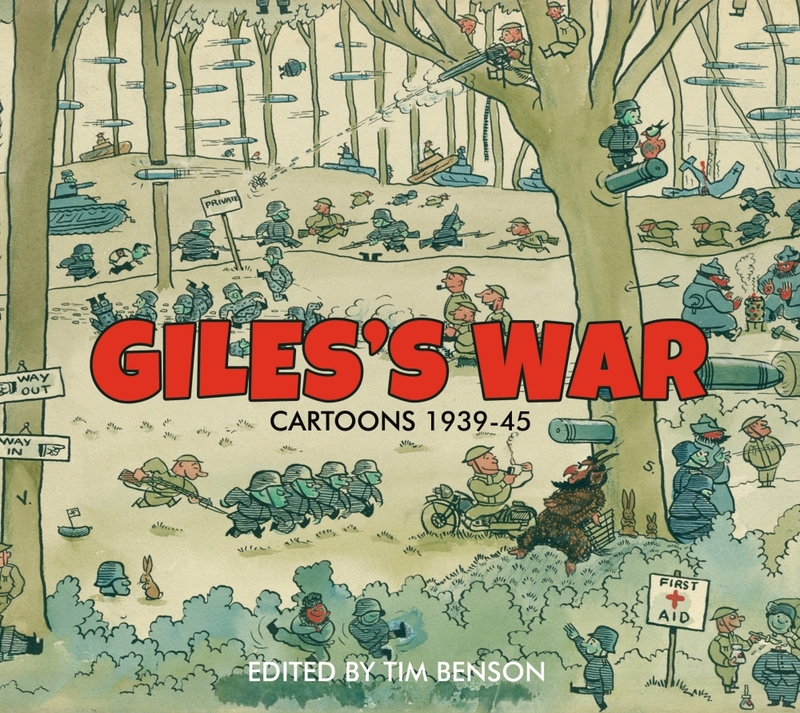 The Political Cartoon Gallery will be presenting an exhibition of Carl Giles’s original cartoons, to be opened by Alan Frame, a former editor of the Daily Express on Tuesday 4 July. 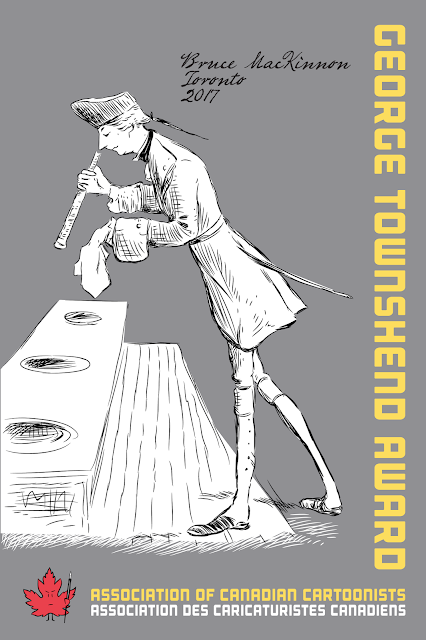 Since 2015, the Association of Canadian Cartoonists has presented the George Townsend Award, named after the first Canadian cartoonist, to the member of the association it deems to have created the best drawing of the year. Bruce MacKinnon of The Halifax Chronicle-Herald won the honour this year, followed by retired Ottawa Sun cartoonist Sue Dewar. 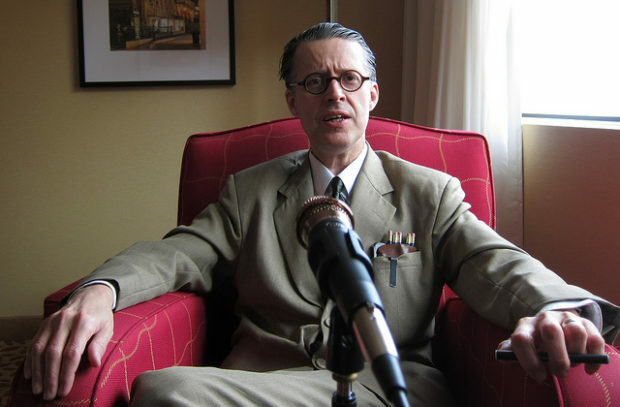 In the episode 220 of Virtual Memories, cartoonist Seth talks about Palookaville, making a living, his changing relationship to comics and cartoonists, his retrospection on the ’90s cohort he came up with, the creative sanctity of the studio and the creation of art no one will see, finishing his Clyde Fans serial after 20 years (and what he wants to work on next), being the subject of a documentary, seeing his work animated, doing collaborative work, taking up photography, a key lesson he learned about marriage, the disadvantages of being a people pleaser, why Kickstarter may be like an IQ test, and more! 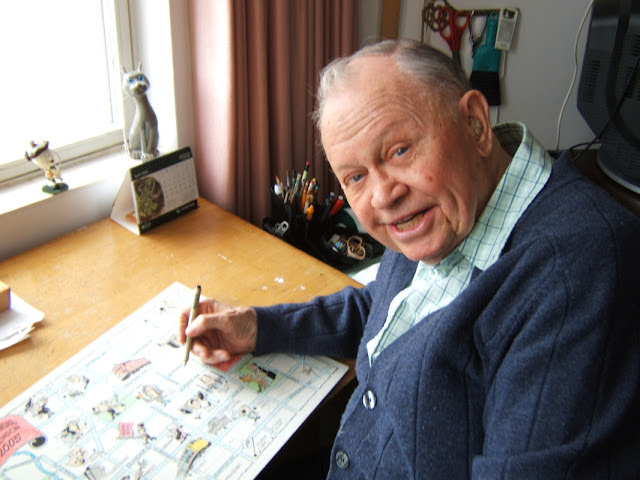 Merle “Ting” Tingley, the editorial cartoonist for The London Free Press from 1948 to 1986, died last Sunday at the age of 95. 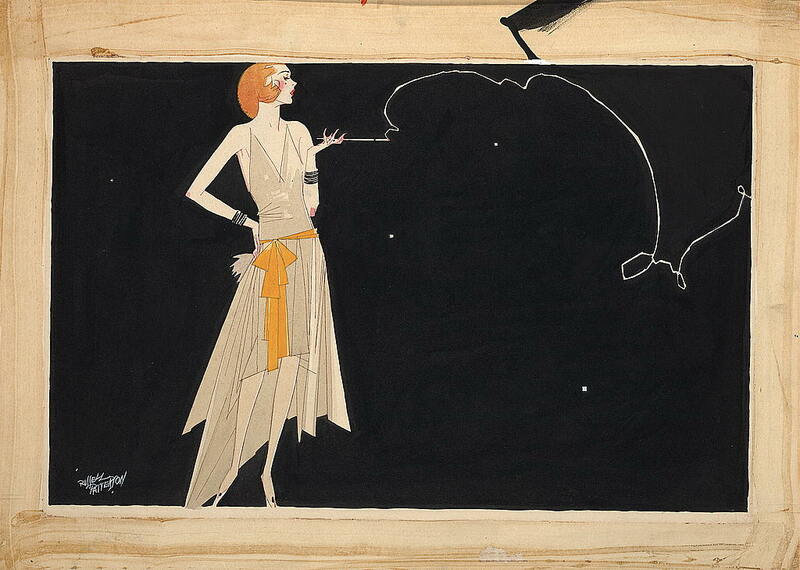 Born and raised in Montreal, he studied art for one year and then worked briefly as a draughtsman until joining the army at the beginning of the Second World War. Known for his pipe-smoking worm named Luke Worm by a reader, he received the National Newspaper Award for editorial cartooning in 1955. Comic strips and comic books are universal art forms, and give their creators a direct line to wide, wide audiences. Some comics are serials, some are satirical, some offer insight, and some just want to make you laugh. Here is a look, from political cartoonists to the creator of a world-famous superhero, at a variety of comic strips and their creators who have been the subject of an NFB film. Joanna Molloy in Fresh Toast. 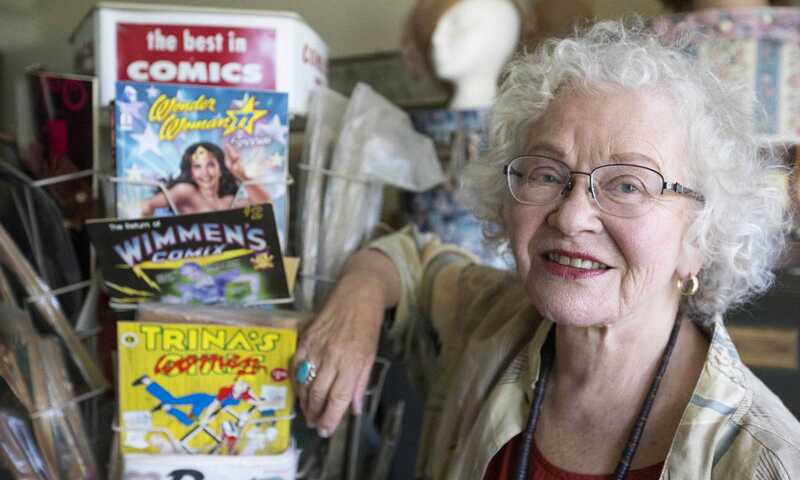 Trina Robbins is the artist behind 'The Legend of Wonder Woman,' which envisioned the amazing Amazon with a female focus. From the City of Rosemère website. 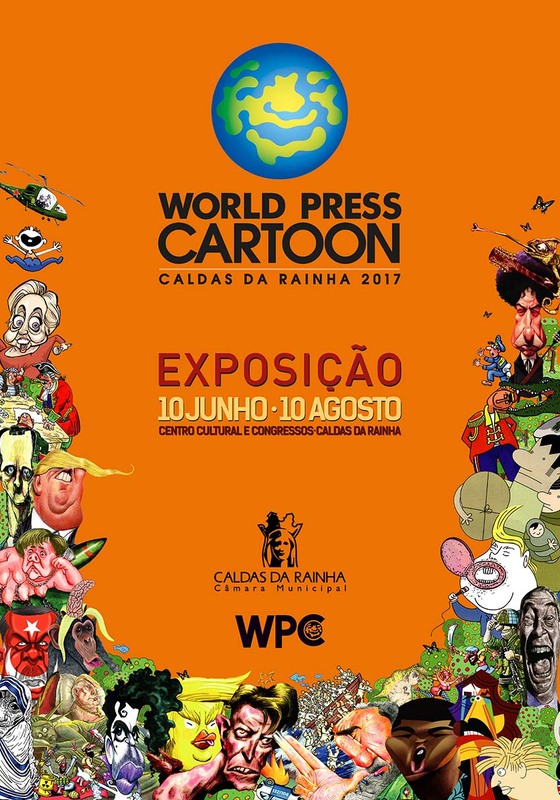 The City of Rosemère, in the lower Laurentians, will present, from Friday June 2 to Sunday June 4, the fourth edition of its' International Caricature Biennial, in the H.-J.-Hemens Municipal Library . The 2017 edition will be held under the honorary chairmanship of Serge Chapleau, editorial cartoonist at La Presse. Comic Kathy Griffin has lost a decade-long gig ringing in the new year for CNN as a backlash builds over her video displaying a likeness of U.S. President Donald Trump's severed head.